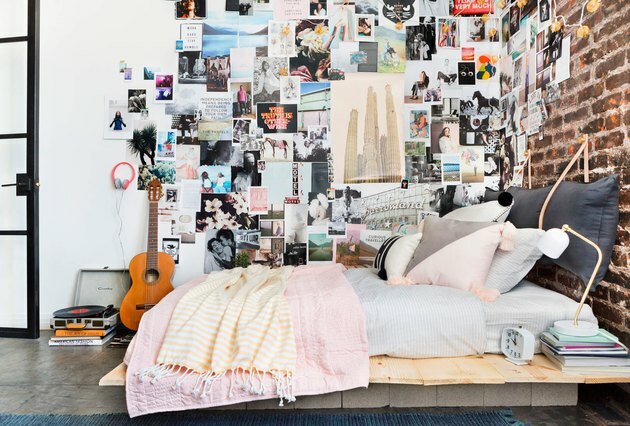 When your dorm room feels like a dull and boring cinder block, expressing your personality can be tough. All of these new friends and no way to show them your killer style? Quelle tragique. Especially when your budget is basically zero. Enter: Ikea, the haven for all things cheap and beautiful. Transform these inexpensive buys into something special that screams you with these eight easy-to-DIY Ikea hacks. Your cookie-cutter dorm room could definitely use some glitz. 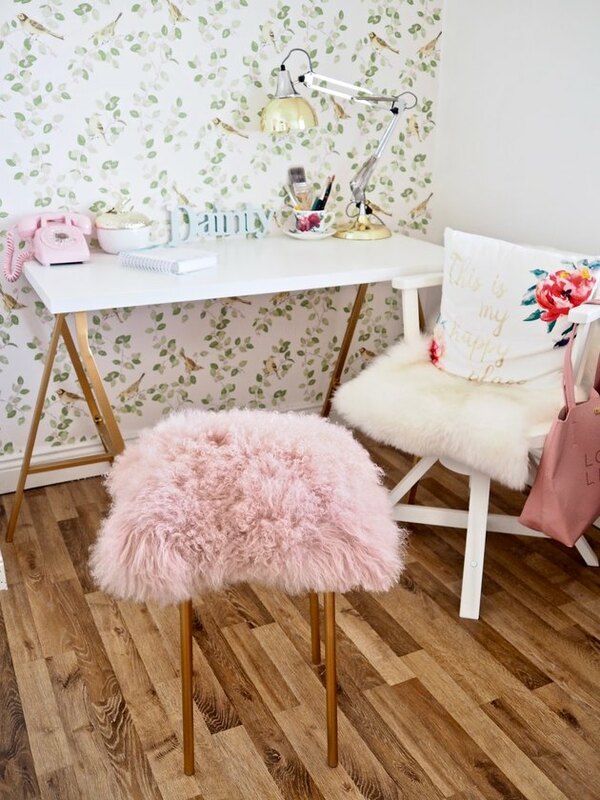 Add a little glamour with Ikea's Marius stool ( $4.99 ). It starts out as an ugly hunk of black plastic, but add some spray paint and an ultra-fluffy faux fur cushion to create this funky seat. Find the instructions over at the Dainty Dress Diaries. 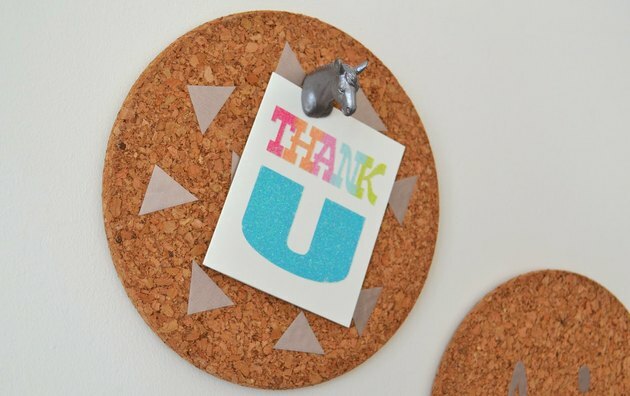 Make the best use of your limited wall space with these cute miniature cork pinboards from Sophie over at The Things She Makes. Press double-sided mounting tape on Ikea's Heat trivets ( $3.99 for a set of 3 ) and cut out shapes to decorate the front. Animal-shaped pins can (instructions here) make a funky home for your keys. 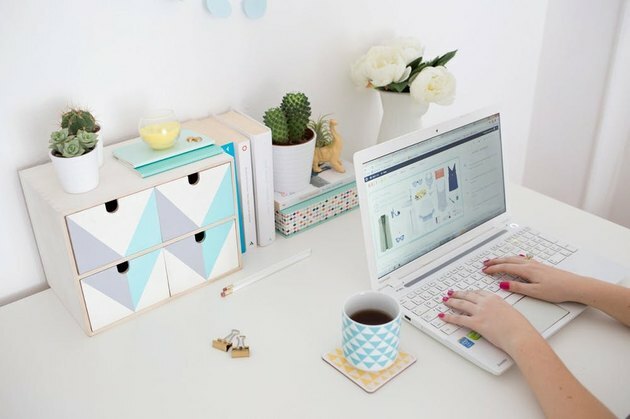 Keep your desk cute and well-organized by upgrading Ikea's Moppe storage chest ( $14.99 ) into a pastel paradise. 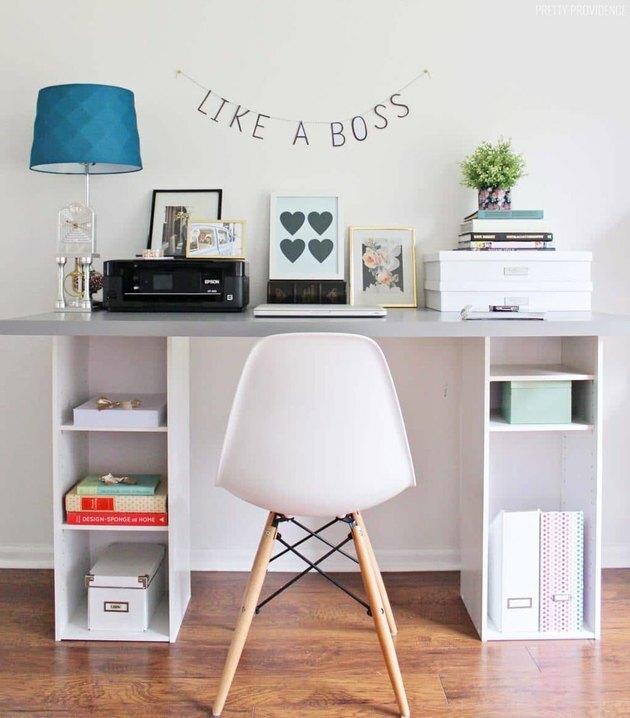 Pick up acrylic paints in your favorite colors and give the desk organizer a makeover with this tutorial from Brit + Co.
Ditch your ugly dorm desk and replace it with this surprisingly stunning, inexpensive hack. Take a stroll in Ikea's desktop section and pick your fave — Pretty Providence selected the dirt-cheap Linnmon ( $13.99 ). Spanned across two bookcases, it provides plenty of space to do your schoolwork. 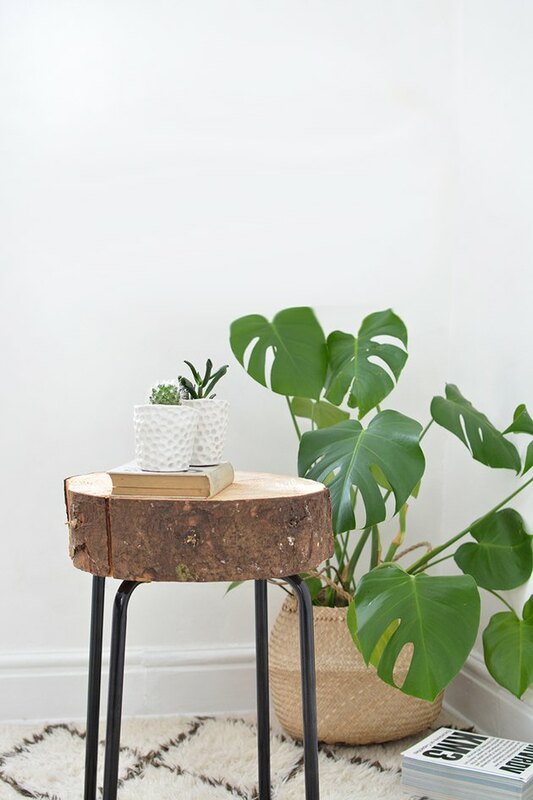 Give your self a little extra table space and turn Ikea's Marius stool ( $4.99 ) into a rustic one-of-a-kind side table. See Caroline's step-by-step DIY instructions over at Burkatron. 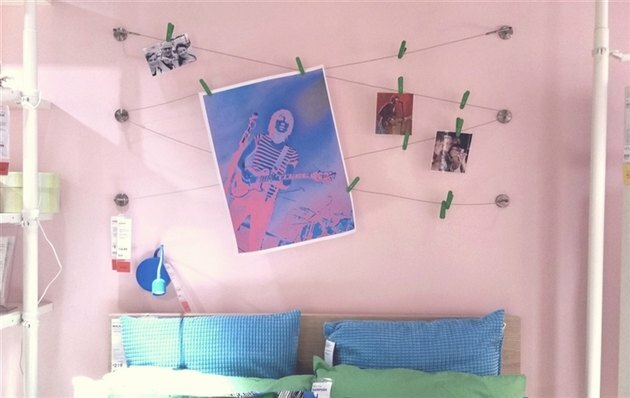 Show off your favorite pictures with this Ikea-approved dorm room hack. Pick up a couple of the hard-to-pronounce Dignitet curtain wires ( $14.99 ) and criss-cross them on the wall behind your bed. Use colorful clothes pins to keep your artwork on display. College dorm floors aren't known for feeling soft and plush. Add a bit color and coziness to your room, and make your toes happy campers in the process, by dyeing Ikea's Tejn faux-sheepskin rug ( $14.99 ). Just follow Brittni Mehlhoff's simple instructions over at Paper & Stitch. 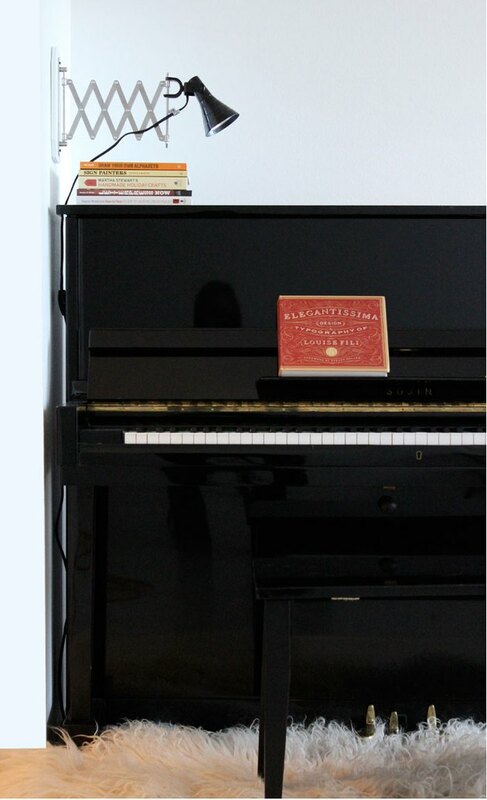 Study late into the night — without bothering your roommate too much — with this easy Ikea upgrade. Combine the Fräck mirror ( $9.99 ) with an inexpensive clamp light to create a clever industrial wall sconce. Hop on over to Poppytalk to see Jan Halvarson's simple instructions.